​It is fantastic having a column with a well known online football magazine. I appreciate that a lot of the joy which I feel is a result of vanity, rather than an overwhelming desire to share my experiences in the women’s game. I was trying hard to think about what to write for this week’s column. I had no idea. ​I sat in my hotel room, a stone’s throw away from Wembley Stadium, with the iconic image dominating the view outside my window. ​What am I going to write about this week? ​I had met England Head Coach, Hope Powell and her assistant coach the day before, at a small coaching event which I was taking part in. This was secretly still on my mind. I had been sat next to the most successful woman coach in the UK for a couple of days. I was preoccupied with these thoughts, and planning coaching sessions in my head, considering my plans for the season which was drawing closer. ​What shall I write about? ​I had met coaches who were ambitious and sounded as though they were doing really well at their respective clubs. Sat in conversation with them, I felt out of my depth. 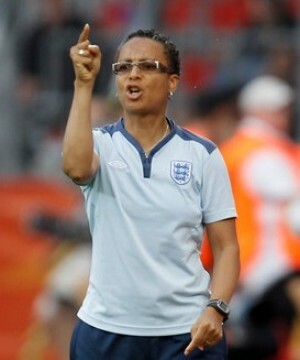 More female coaches are needed. approximately 120 UEFA A Licensed coaches who are women. Myself and the other coaches who attended this course have high hopes of gaining this qualification and increasing the figure. ​I have always been skeptical about groups which are in place to look after the interests of those in the minority. I had felt that it threatens efforts being made to create inclusion. Isolating groups with the intention of providing tailored support can be divisive. This is pretty personal to me and an issue which I rarely discuss. I always want to compete on a level playing field. I resist any suggestion that I have been given any unfair advantage. But, I love football. I have found out this week that I am naïve to think that the world operates in the same way in which I prefer to compete. ​I discussed my coaching topic and other coaching issues with the small group of coaches, the England manager and her assistant. ​As I struggle to find something to write about this week, I will consider writing about my awakening. I will consider writing about understanding a little more about the environment that I am in, which battles do I fight? When do I concede defeat? Maybe even respecting processes which are in place and how they came to exist. I will definitely write about how charming and genuine I found Hope Powell (pictured) to be and her genuine invested interest in our development as female coaches.